I don't know about you, but whenever I see a bottle of shampoo sitting on a drugstore shelf, the product seems so carefully manufactured, so fixed in its place, that I never stop to think about the human beings or real-life processes that go into its making. Even as a beauty editor, I almost envisioned the process of creating a drugstore shampoo as so automatic that living people weren't even involved. This was my impression until spring of this year when Unilever's newly released drugstore haircare brand ApotheCare Essentials invited me (and a few other beauty editors) to its lab in Liverpool, England, to witness the entire process of how its four shampoo formulas are made. For two days, I suited up in a lab coat, goggles, hair net, and (hilariously oversized) safety footwear, rolled up my sleeves, and played cosmetic chemist to learn about the real-life people and steps that go into making a drugstore shampoo. Of course, not every line of affordable haircare is formulated this way; but, if you're interested in a behind-the-scenes look at how a major drugstore shampoo lab works, keep on scrolling. It's hard to imagine a soapy shampoo starting out as real plants and herbs, but I saw before my own eyes: It does. ApotheCare Essentials has four shampoo formulas catered to different concerns (dry hair, damaged hair, fine and flat hair, and color-treated hair), and though each formula share certain ingredients in common, like surfactants (synthetic cleansing ingredients) and emollients (moisturizing ingredients), it's these choice plants that distinguish the results that one formula will have from the next. "Each ingredient within our collection was chosen because it was used historically for hair … either for traditional medicine or local wisdom," explains biochemist and ApotheCare Essentials lead scientist Matt Seal. "We seek out ingredients from a range of sources that deliver various benefits to address a range of consumer needs, and then we apply scientific techniques to improve their performance." In the lab, Seal showed us some of the raw plant ingredients their research team selected for the shampoos: burdock, known for its detox properties; white willow, which is soothing; rosemary, an invigorating herb; gingko biloba, which promotes circulation and balance; sage, used for purifying; and sea buckthorn, known for its revitalizing properties. Interestingly, even though they're going into drugstore products, these ingredients aren't necessarily lower quality, less researched, or less effective than expensive shampoos. As a cosmetic chemist named Don Frey once explained to me, premium hair care brands tend to have an edge when it comes to styling products ("The last thing you put on your hair is going to have the biggest effect on what you see," he said), but sometimes the ingredients in a luxury line's hair care, like shampoo and conditioner, are identical to the drugstore stuff. For that reason, you might want to splurge on, say, a texture spray, but could get away with saving on shampoo. To turn those herbs into liquid, which can then be mixed with other things, ApotheCare Essentials' biochemists use a controlled process they've termed phyto-extraction, which snags the highest-quality version of the desired ingredient from each plant. Most hair care products that use plant ingredients have some sort of extraction process but ApotheCARE Essentials' is surprisingly high-tech: With phyto-extraction, concentrated energy waves burst the cells within each plant to capture its "core essence." In the lab, this is thankfully done by machine and not by a handful of clumsy reporters with mortars and pestles. If you want to nerd out a bit more on how phyto-extraction works, Seal has a pretty clear explanation: It uses "electromagnetic waves that cause the cell wall to gently vibrate, and this vibration and energy absorbed cause the cell walls to burst without any physical contact. Once the cell wall has burst, the inner contents are released, and this blend … is then purified through a series of filtration steps to remove any impurities. The output is a higher level of the soluble inner parts of plant cells, which often contain the specific ingredients we are looking for (for example, salicin from white willow bark)." A visit to the main lab floor would reveal that creating a shampoo isn't simply a matter of blending that phytoextraction with some water, some detergent, and calling it a day. It's like baking—leave something in the oven (or the beaker, as it were) for 10 seconds too long or at a temperature 10 degrees too cool, and the whole recipe is shot. Or in this case, the texture might end up clumpy or stringy. "We enhance the quality using precise temperature and timing to slowly and carefully infuse each of the ingredients," says Seal. "This is a critical part of our product design, focusing not only on the ingredients we use but how they can be improved further through meticulous control during the making process." Each shampoo formula is tested in small batches before it's taken to the big lab to be produced in larger quantities, and every testing stage is assessed and perfected by someone with a chemistry degree in safety goggles. Then, once the recipe is set and it hits the large machines, it's monitored by a real human at every step to make sure all runs smoothly. Perhaps the most surprising part of the shampoo formulation process was how seriously fragrance is taken into consideration. ApotheCare Essentials uses an entire outside team of perfume experts to create custom fragrances for each shampoo to match the vibe of the formula. For example, because the Booster shampoo for fine and flat hair aims to create volume, the fragrance team wanted an energetic scent to match. After experimenting with various combinations, they landed on a refreshing geranium-forward blend. Witnessing the physical results of each shampoo formula is obviously incredibly important, so after walking through each step in the formulation and creation process, the ApotheCare Essentials team led us to the mini salon at the lab to experiment with washing strips of hair extensions and giving them feedback, just as their stylists would. 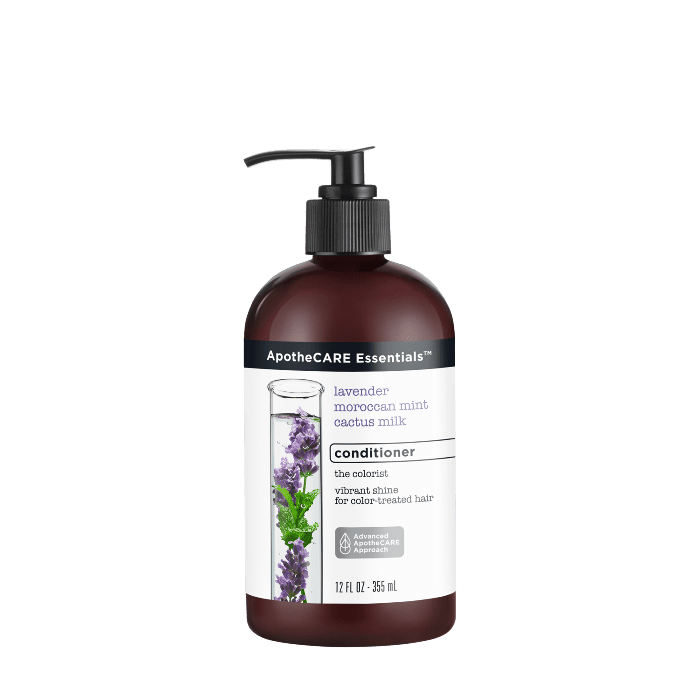 As an artificial blonde, my ApotheCare Essentials formula of choice was the one for color-treated hair, which incorporates distilled lavender, Moroccan mint, and filtrated cactus milk, ingredients which work to make color-damaged hair look healthy and glossy. After two days of cooping my strands up in a hair net, I washed and styled it with the Colorist line, newly appreciative of the work that went into making the product smell lovely, cleanse my strands, and give them major shine. This trip was paid for by ApotheCare Essentials. Editor's opinions are her own.